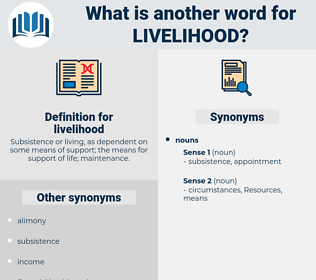 What is another word for livelihood? 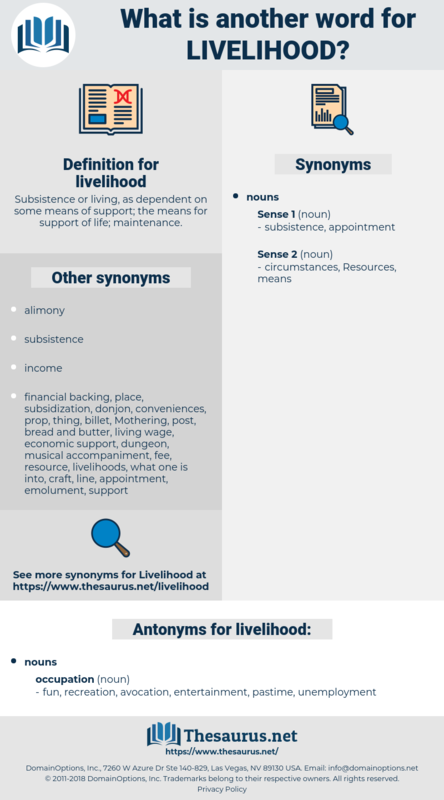 Subsistence or living, as dependent on some means of support; the means for support of life; maintenance. media, breadwinner, income, well-being, lifeline, Earning, life-style. needs, survival, lifeblood, subsistence, living, nourishment, life, sustenance, revenue. fun, recreation, avocation, entertainment, pastime, unemployment. It is generally quite impossible to return them to their own homes, therefore all that can be done is to instruct them in some useful work by which they can earn their livelihood. As long as there was a possibility that I'd be stranded in my own time, I wasn't going to lose my livelihood. leaflet, leaf blade, labeled, labelled, l-plate, life belt, lollipop lady, liability, lifeblood, live load, levelheaded, La Plata, level-headed.